Don’t miss your chance to meander through the National Zoo's Annual Winter Celebration which is taking place from December 4, 2009 thru January 2, 2010. See thousands of sparkling environmentally-friendly lights and animated exhibits, attend special keeper talks, and enjoy live entertainment provided by Bialek's Music.inment for the National Zoo's Annual Winter Celebration which is taking place from December 4, 2009 thru January 2, 2010. But that's not all. Every evening, our friends from Pepco educate visitors about simple practices they can adopt in their households to save energy. The larger-than-life ZooLight displays are all constructed of LED lights that use about 90 percent less energy than traditional incandescent light bulbs. 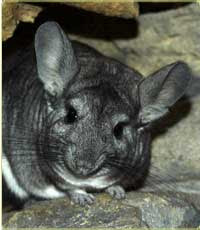 And last but not least, visitors have the chance to see lots of animals. The Fujifilm Giant Panda Habitat, Small Mammal House, Great Ape House, Reptile Discovery Center, Think Tank, and Kids' Farm will be open every night. DJ Dan at Longview Gallery! On December 15th, I DJ'ed an event for DC Council and Human Rights Compaign, celebrating the new Gay Marriage Bill . Check out the vid! This is a huge victory for the Gay & Lesbian citizens of DC, and is something I wholeheartedly support. A big congrats to all the hardworking individuals who worked tirelessly on getting this bill passed! Would also like to give a big thank you to Suzi Molak at Longview Gallery for hooking me up with this event! The all-new Long View Gallery features 5,000 square feet of superior interior with two flexible halls, impeccable lighting and all the smart tech to raise your next event to an art form. 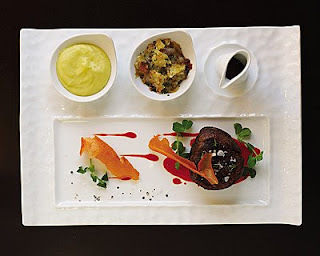 For corporate occasions, life celebrations and all sorts of hip happenings. Michele Choi hosted a Biznet Luncheon on Wednesday September 9, 2009 for a small interesting and eclectic group. Our guest speaker was Dave Boyd. He told us to never count any contact out. You never know who knows who and we should be a little more personal, so we are remembered. Michele made us all feel welcome and relaxed. The weather and fabulous lunch was the icing on the cake. Had another great Women's Networking Luncheon @ Stonewall Golf and Country Club on Tuesday, September 8, 2009. Jeanna Hilton had a great guest speaker, Marc McIntosh, producer of the Washington Bridal Showcases. These luncheons help the regular attendees stay in touch and bring in new recruits. He suggested that I send a photograph of me and my booth when I e-mail the clients from the show to follow up, so they remember who I am. Traveling South, I was met by Cheryl Cox at Comus Inn, who was preparing for 3 Weddings last weekend. 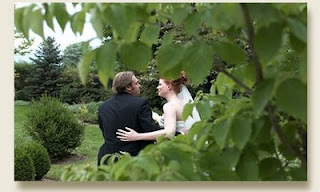 The Inn's charm and romantic setting are big hits among Brides, and the view...absolutely stunning. I was also treated to lunch, and the crab cake BLT was like no other sandwich I've ever had! A beautiful tent was being up for this weeks festivities and Cheryl was on top of all the events for the elegant weekend ahead! 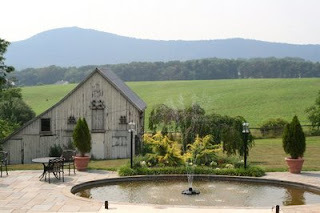 I can't wait go back for dinner and also encourage all of you planners to visit this gem on Sugarloaf Mountain. When the going gets tough, it's time for a roadtrip! Last week, I went to visit Bonnie Swanson at Musket Ridge Golf Club in Myersville. This gem overlooks the beautiful Sugarloaf Mountains. Golfing here has always been top notch, but the new ballroom is immaculate, and outdoor Weddings with the golf course/mountain view are breathtaking. Bonnie will also throw in a few rounds of golf for the Groom and a few buddies. The 45 minute scenic drive was well worth it. Bonnie made me feel part of the Musket Ridge family as Civil War sites and other interesting pieces of history were pointed out. 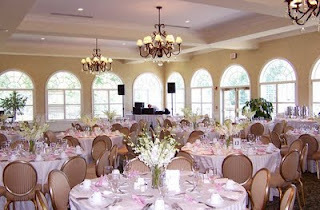 I suggest that all party planners make a site visit and check out this fabulous event space and golf course! 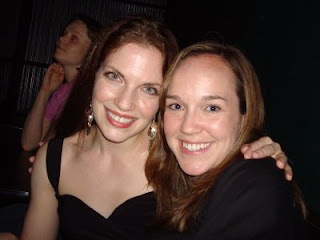 Last night I met Christine Godsey, the newest member of one of the DC area's premiere Wedding Planning companies, Engaging Affairs. Christine Godsey began her event management career 5+ years ago while working at The Staubach Company, a corporate real estate consulting firm. 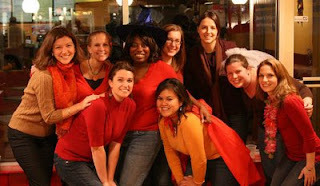 There, she planned a variety of events such as holiday parities, incentive outings, networking events and offsite meetings. While at The Staubach Company, she realized her true passion in life...planning events. Christine attended and completed George Washington University’s Event Management Certificate Program. While studying at George Washington, her weekends and evenings were spent learning from and working alongside some of DC's finest event planners, assisting the coordination of weddings and corporate events to destination management. Since then, Christine has left the corporate world to work in events full time. Recently joining Engaging Affairs, Christine has been busy planning events and wedding of all sizes and budgets. Her biggest reward is a flawless event where everyone is having a great time. Christine has been educated in international protocol and etiquette by The International Society of Protocol & Etiquette Professionals. 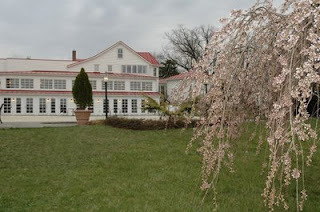 I had a wonderful experience at a jewel of a destination last Thursday, Herrington on the Bay in Friendship, MD. Innkeeper Anna Willman showed us a great time with a tour of the beach area for Wedding Ceremonies, the pavilion for receptions, and the remodeled rooms for Wedding guests and vacationers. Kudos to Ridgewells Catering for trying to teach me to cook last Wednesday. 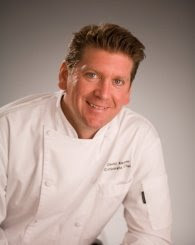 David Keener (above), Corporate Chef at Ridgewells, gave a wonderful culinary demonstration on casual home entertaining. Their new showroom is awesome and our group, SESMA, started with some strong margaritas. DJ Debbie Bulles and I participated in the Stonewall Golf Club bridal show on Sunday April 26, 2009. 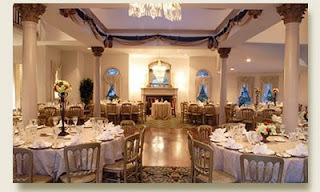 The exquisitely designed clubhouse and elegantly adorned Magnolia Room offered grand panoramic views of Lake Manassas, water fountains and golf courses. There was a classical string quartet playing as guests strolled from vendor table to vendor table, inquiring about Bialek's Music DJ's, bands and everything else from photographers to cake designers. There were also live models showing off designer wedding dresses. It was a beautiful sunny day, complimentary drinks and horderves were served, helping put everybody in a great mood. 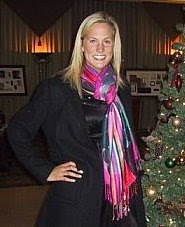 Big kudos to Jeanna Hilton, the Director of Sales at Stonewall GC! 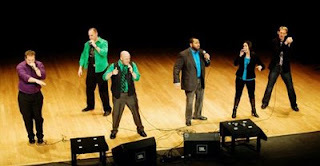 Thoroughly enjoyed the Accapella concert at Jammin Java last night. The three groups, Kismet (above), Skyline, and Cartoon Johnny (below) were superb. Dan's friend Judy sung her heart out (last Lady on the right)! This was the first time we'd seen Kismet and they didn't disappoint. 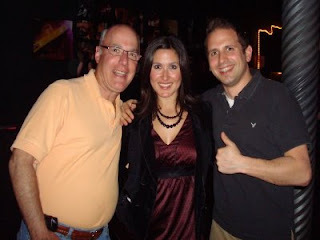 Dan and I are already big fans of Cartoon Johnny and their token female vocalist, Darcy Ramano. 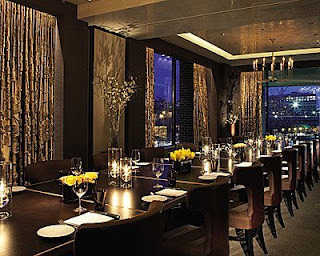 We've booked them a few times already for cocktail receptions. Finally, we got to see her Daughter for the first time. CUTEST...KID....EVER. 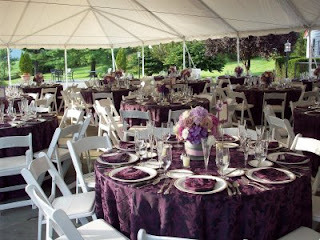 I want to give kudos to Nicole Haddow, Catering Director of Manor Country Club, for the wonderful food and beverage supplied for the Amity Club installation on April 21. Best cocktail weenies, filet mignon, and carrot cake ever! 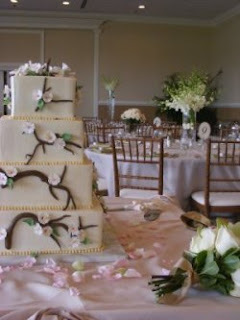 Go to www.manorcc.org to book your next event there. 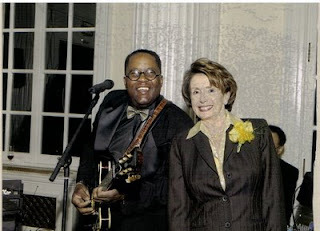 When the Stimson Center called us to supply music for an Ambassador Tribute at the Embassy of Singapore on April 22, Show Biz with Kenny Holmes filled the niche and made friends with our Speaker Nancy Pelosi.